I don't remember when I bought this, though I know it wasn't more than five bucks. That's about right, as this isn't a well-made or even very necessary compilation. I think it might have been an excuse to release "Damn It Feels Good to Be a Gangsta," as that and "Action Speaks Louder Than Words" are the only things I can figure to account for the "Bonus cuts stolen from upcoming album featuring Big Mike" exclamation on the front. Almost everything else on this disc is from either their eponymous album or We Can't Be Stopped, and the tracks are neither chronological or sequenced in any discernible way. I have a love/hate relationship with the Geto Boys, and it's played out across this disc. I think "Mind Playing Tricks on Me" (incorrectly listed here as "My Mind Playin' Tricks on Me") is an incredible song. I think "Mind of a Lunatic" is a terrible song, for a countless amount of reasons. And so it goes with the rest of this record. I love half of it, and hate the other half. Sometimes I feel like if I was an upstanding human I wouldn't listen to Geto Boys, but then I realize it's just one of the nutty contradictions that makes me me. And right now, I'm feeling embarrassed that I own a Geto Boys greatest hits collection. 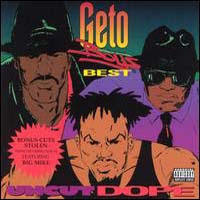 Pretty lazy of me, but unfortunately, collecting the Geto Boys discography is not at the top of my list right now. "Do It Like A G.O."